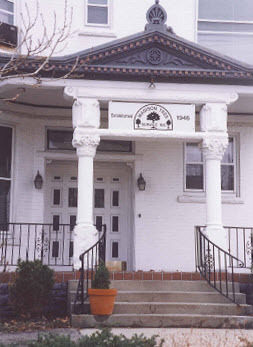 Madison Tree was established in March of 1946 by Ed and Dora Mae Butcher. We thought it would be nice to share the story with you. Ed Butcher grew up on the Emery estate (Peterloon) on Hopewell Rd. He probably got his love of trees from his father, Richard W. Butcher, who was an orchardist on the estate. Ed, whose nose was always in a book, graduated from Sycamore High School and then entered the Merchant Marine. He later joined the US Navy and served on submarines in the pacific theater during World War II. Ed was honorably discharged in early 1946 at the ripe old age of 23. He returned to Cincinnati and took a job as a climber in the Natorp organization. Family lore has it that a couple of months after he started, Ed asked Mr. Natorp for a raise from 50 cents an hour to $1.00 an hour. Mr. Natorp supposedly replied that there was no tree man on earth worth $1.00 an hour! Ed promptly gave him his resignation (and probably a piece of his mind) and decided to start his own company. Thank you, Mr. Natorp! Shortly after Ed returned to Cincinnati, he met a pretty red haired 17 year old girl named Dora Mae Headley. She worked at the Five and Dime store on Madison Rd. in Madisonville with his sister, Geneva. 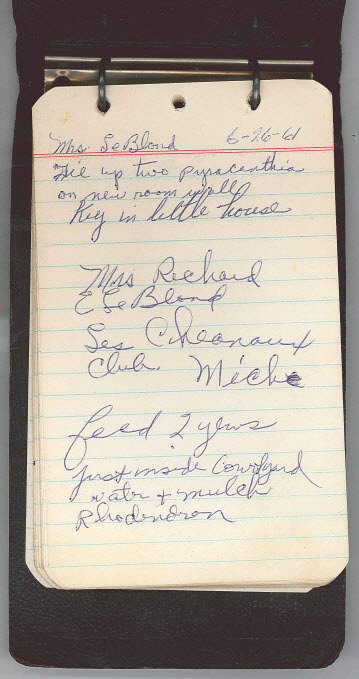 Three weeks later, on Saturday, March 23, 1946, Ed married Dora Mae in the tiny Eastminister Presbyterian Church near the corner of Erie Ave. and Roe St. It was a very small affair. The bride was dressed in a pea green suit, black hat and black shoes. She would later wonder what on earth made her choose that black hat! Unfortunately, no one took pictures to document this momentous occasion. The honeymoon consisted of a one night stay at the Mariemont Inn. The following Monday, Ed went to his newly rented office in the Red Onion at 6300 Madison Rd. and opened the doors of Madison Tree Specialists. Thus began a remarkable partnership, both personal and professional. Starting a company from nothing in 1946 was not an easy proposition. Ed had a rope, a saddle, a hand saw, a borrowed twenty dollar bill (he later used to buy a cross cut saw) a desk and a phone. The phone number “BRamble 1-5071” stayed the same for over 50 years. There was no money for a truck or other equipment, so Ed rode the street car to the jobs and carried his tools with him. The majority of the work was in Hyde Park. The business grew by word of mouth. From the very beginning Ed’s focus was on quality. He earned a reputation of being knowledgeable, hard working, honest and fair. Those principals are still the core of the company’s values. 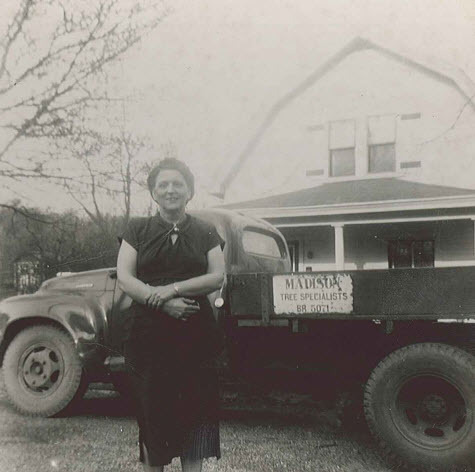 The business grew and in 1948, Ed and Dora bought the first truck for a total cost of $307.60. It was a 1937 Ford flat bed. After the $100.00 down payment they made weekly payments of $10.00 each. It was said that the truck went down the road “doggie fashion”. Now they had a way to get to work in Indian Hill! The truck served as both business and personal transportation. It was the vehicle Ed used to drive Dora Mae to Mercy Hospital to deliver their daughter, Sandra, on June 15, 1948. It was replaced by a 1949 Studebaker in time to deliver Dora Maeback to Mercy ‘in style’ for the birth of their second daughter, Rusty, in March 1950. Shortly after that momentous occasion, the truck was parked while Ed was recalled to active duty to serve in the Korean War. During the year and a half that Ed was back at sea, his father kept the business going. When he returned, Ed and Dora bought a house on Jameson St. in Madisonville. The business office moved to the kitchen table, the trucks to the drive and the name changed to Madison Tree Service. Business was back in full force once more and the family was growing right along with it. Between 1952 and 1954, Pamela, Richard and Jack were born. John was born in 1959 and Doralynn, the caboose, came along in 1968. Always an innovator and on the cutting edge of what was new in arboriculture practices, Ed partnered with Tom Pitts in the late 1950’s to form E&T Spray Service. They branched out in to spraying trees, shrubs and lawns for insect and disease control. It was the beginning of what is now our Plant Health Care program. Ed later bought out Mr. Pitts but continued the commitment to providing full service tree care to his clients. In 1962 the family moved to a house on Arnsby Place and the business went with it. By then MTS had 3 crews in the field everyday. The core employees were young men from Kentucky (boys who went “down home” on the weekends). Family members were a big part of the work force too, including, uncles, brothers in law, nephews and cousins. Richard began his career at age 8 and Jack at age 9. John (being the baby boy) started at age 10. They worked Saturdays and summers earning 50 cents an hour and were required to pay $2.25 a week in room and board! The work was hard (dragging hose for the sprayer, pulling brush to the truck, raking, and hauling tools for the climbers) but to hear the stories, they had a lot of fun too! In 1969, Ed and Dora Mae bought a burnt out meat market in Madisonville and the company moved back to a Madison Rd. address. They also ventured into retail, selling tree care and landscaping supplies and Ashley wood stoves. By the mid 1970’s Jack and Richard were working full time in the business. With most of the kids grown and out of the house, Dora Mae began working full time as well. She continued her role as advisor and took over as store manager. John started full time in 1981 as did Rusty. After 45 years at the helm, Ed “retired” from the day to day operations on December 31, 1991 and Jack was named President. Ed continued to come to the office everyday and began a consulting arborist business called Arbor Consult Ltd. Dora Mae “retired” in 1998 when the retail store was sold and her input is invaluable. By 1999 MTS out grew the Madison Rd. location and moved to the current location on Round Bottom Rd. in Milford. Sustained and consistent growth in the landscaping services offered, prompted the change of the company name to Madison Tree Care & Landscaping in 2004. Ed Butcher passed away on January 8, 2002. He was the leading authority on tree care in the city for over 50 years. He was an adjunct professor of Arboriculture at what was then Cincinnati Technical College, and a sought after speaker on the lecture circuit of garden clubs and industry conferences. He was one of the first Certified Arborists in Ohio and one of the first Registered Consulting Arborists in the city. We miss him everyday. Today, Jack, Richard, John and now two of Jack’s sons, Jay and Jon Butcher, provide the leadership. Along with a very dedicated staff of managers and crews they continue to follow Ed and Dora Mae’s principals and values to make MTC&L the leading tree care and landscaping company in the Greater Cincinnati area.